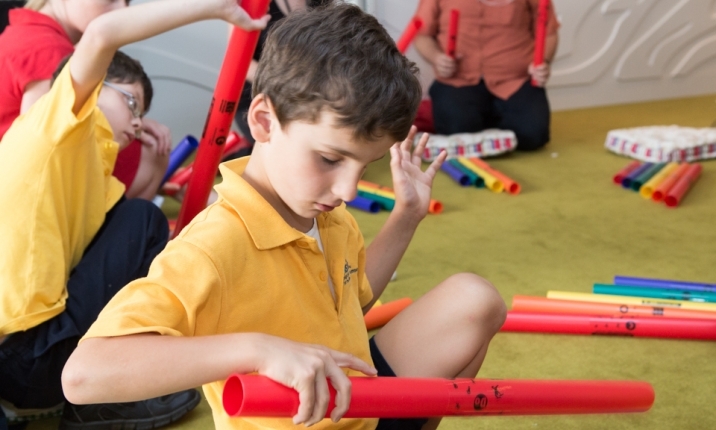 The Sound Matters workshop series at Melbourne Recital Centre provides an interactive and engaging musical learning environment especially designed for children who are blind or have low vision. Working in partnership with Vision Australia and Insight Education, we are hosting four intimate workshops throughout 2019, with an emphasis on exploration and composition. Each one-hour session will allow participants to hear familiar repertoire performed up close and personal by professional musicians, as well as the opportunity to work directly with the facilitators in creating brand new sounds. Workshops are designed for children between 10-14 years of age who are blind or have low vision. If you would like to register your child for the first free workshop on Wednesday 27 March, please complete this registration form. Places are limited, and registrations are essential. Melbourne Recital Centre is working with oboist Ben Opie on the Sound Matters workshop series in 2019. Ben’s incredibly versatile career has included collaboration with new music ensembles through to working with orchestras in Germany, France, Bahrain, America and Australia. In 2014, Ben co-founded Inventi Ensemble who have established twice-weekly interactive music workshops in Melbourne’s immigration detention centres, custom workshops for children with disabilities, and	established a range of concert series in local communities around Melbourne. They also present innovative interactive children’s music workshops from instrument making to improvisation and new compositions. Each workshop, Ben will lead a group of musicians from the Australian National Academy of Music (ANAM). The only professional performance training institute in Australia, and one of few in the world, ANAM is renowned for its innovation and energy, and is committed to pushing the boundaries of how music is presented and performed.